United Cutlery celebrates 20th anniversary of acclaimed Kit Rae Fantasy Art line, marks milestone with commemorative fantasy sword release. 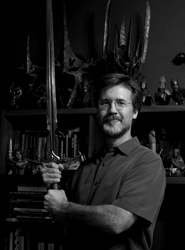 Kit Rae, master artist and fantasy weapons designer. Kit has without question been one of our most valuable partners over the years; talent like his is rare, and we’re so lucky to be able to develop and produce his incredible designs. This year, United Cutlery (UC) - a multi-brand knife, sword and licensed movie replica manufacturer based in southern Georgia - celebrates the 20th anniversary of one of its best-selling and most renowned brands: the Kit Rae Fantasy Art line. For two decades, the Kit Rae Fantasy Art line has pushed bladecraft boundaries and blurred the lines between “cutlery” and “art.” Since its inception in 1997, the brand has spawned some of founder and legendary blade designer Kit Rae’s boldest, most inventive work - 50 unique sword, axe and knife designs; a host of companion paintings and illustrations; even a mythological universe, created and penned by Rae himself. The Kit Rae Fantasy Art line has yielded scores of top performing products over the years; among the most acclaimed is the “Swords of the Ancients” collection, an ongoing series of medieval-inspired fantasy weapons, each with its own backstory that fits into an elaborate mythology created by Rae. Many “Swords of the Ancients,” as well as other Kit Rae fantasy weapons, even include colorful, highly detailed prints of Rae’s original illustrations, often depicting scenes from the accompanying weapon’s own saga. The Kit Rae Fantasy Art line has left its mark on more than just UC these past 20 years; the brand has proved a major driving force behind the entire fantasy weapon and art industry, as well. Many industry experts credit Rae’s “Swords of the Ancients” collection with single-handedly giving rise to the popular fantasy weapon industry, which has experienced explosive growth over the last several decades. “The original 10 swords from the SOTA collection are now highly sought-after treasures, and I try to add at least two pieces to the collection annually,” Rae says. The “Swords of the Ancients” collection include Rae’s favorite sword design, “Exotath.” To commemorate the Kit Rae Fantasy Art line’s 20th anniversary, this week United Cutlery released a special “dark” edition of the Exotath. According to Rae's original "Swords of the Ancients" mythology, the Exotath was wielded by the dark elf Agnemmel, fierce war captain for the sinister, god-like entity known, ominously, as "the Dark One." The blade, the tales say, was forged by Firaneth, greatest of all elven weapon smiths, and allowed Agnemmel to envision the future, giving him great advantage in battle. Crafted here on earth by UC, the 20th Anniversary Exotath features a special “dark iron” finish that recalls the brooding, fire-wrought blades of the Middle Ages. Like every “Swords of the Ancients” fantasy weapon, the Exotath – both the original and 20th Anniversary “Dark” Edition – is equipped with a display-edged tempered stainless steel blade and an intricately sculptured metal hilt. Exotath highlights include bat-wing crossguard, leather-wrapped blade grip and handle, delicate rune-like blade etchings and wooden display plaque with commemorative 20th Anniversary coin inset. The Kit Rae Fantasy Art line is one of dozens of United Cutlery brands, all of which are featured in the company’s annual master catalog and on its ecommerce website. In addition to knives, swords and other cutlery, UC brands produce a variety of self-defense tools, consumer electronics and even movie prop reproductions. UC is the is the only cutlery firm in the United States licensed to replicate knives, swords, armor and other weaponry from numerous blockbuster films, including New Line’s “Lord of the Rings” and “Hobbit” trilogies, “The Expendables” series, “Star Trek: Nemesis” and many more. For more information on the Kit Rae Fantasy Art line, United Cutlery and/or UC brands, visit http://www.unitedcutlery.com. For more information on OTEB, visit http://www.ontheedgebrands.com.